Bipartisan members of congress joined Iranian Americans from 40 states at a Congressional event to express support for protesters in Iran. 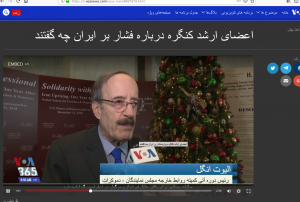 Bipartisan members of congress joined Iranian Americans from 40 states at a Congressional event to express support for protesters in Iran, announce bipartisan congressional initiative H.Res.1034, and highlight Iranian regime’s malign international role. Timed to coincide with the anniversary of nationwide protests in Iran, the gathering, moderated by OIAC Advisory Board member Dr. Ramesh Sepehrrad, showcased congressional and community support for the Iranian people and their democratic opposition movement. 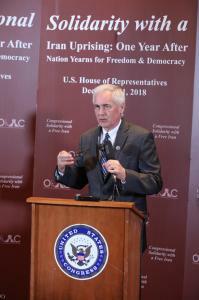 In his opening remarks, congressman Tom McClintock (R-CA) noted, “As the journey of the mullahs has become more extreme, the international resistance to them has become more resolute. We’ve seen this in the liberation of the MEK freedom fighters trapped in Iraq.” We’ve also “seen it with the 105 of my colleagues, here in the House of Representatives who co-sponsored my bill, House Resolution 1034 that we affirmed our committed support of the Iranian people’s desire for a democratic, secular, and non-nuclear republic of Iran,” Mr. McClintock added. “I’m proud to co-sponsor House Resolution 1034 which condemns Iran’s state sponsored terrorism and expresses support for the Iranian people fighting for free, democratic, and secular future,” added Congresswoman Judy Chu (D-CA). 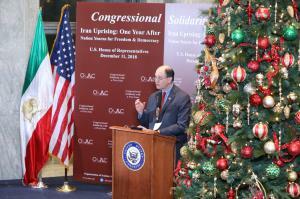 Rep. Brad Sherman (D-CA) recognized U.S. Teamsters Union for, “joining in support of the Iranian truck drivers protesting for democracy in Iran.” He commended the Iranian opposition leader Maryam Rajavi for “her continuing advocacy for women’s rights and minority rights in Iran,” while lauding the opposition movement, the MEK, for exposing the nuclear sites of the Iranian regime in 2002. “I’m a co-chair of the Congressional Iran Human Rights and Democracy Caucus, and I’m proud of that. I will continue to condemn the Iranian regime’s abuses of human rights and its support for terrorism,” Rep. Steve Cohen (D-TN) said. Rep. Mike Coffman (R-CO) noted also that all must stand in solidarity with the people of Iran, but “it’s so important for the United States to not lose its focus” on the Iranian regime. Former U.S. Ambassador to Bahrain Adam Ereli, also addressed the event. “I think it’s clear to anybody who follows Iran closely that the mullahs are afraid. And they’re afraid of you…When Iran [regime] blames Maryam Rajavi, the Iranian opposition and the Iranian American diaspora for these protests, it just tells you how afraid they are, how vulnerable they are, and how effective you are,” he said.